Well, Thanksgiving has been and gone (I hope you all had a good one! ), my son Nicky celebrated his birthday in style and we spent a wonderful weekend with some very special people at their lovely home in Cornwall. To my American friends reading this, Cornwall is part of what we Brits call ‘The West Country’, lying as the name suggests in the furthest south-western part of the British Isles. A very popular place for families to spend their summer hols but also for just about anyone to visit at any time of year. back up the hill to the car park! But we did it! You can see from these photos that despite it being the very end of November, and yes, it was quite chilly, the sun shone brightly giving rise to one of those beautifully crisp winter days so that you can walk about in a jacket and feel warm and cosy but not so overdressed that as soon as you start exerting any energy, as in walking, you want to rip your jacket off again! These are my favourite kind of days. The day we visited Fowey there was a Christmas market and it was very busy but it was lovely to stroll around the unique boutique-style shops and sample the food and wines on offer at various marquees. That, and also trying to avoid being hounded by the local ‘pirates’ who were rather exhuberant in their well-intentioned efforts to take up a collection for the Royal National Lifeboat Association (RNLI). A very good cause though it be! For me, however, Cornwall (and particularly Fowey), has long-held a deep fascination as it was the home of the incomparable Daphne du Maurier, she the wonderful author of one of my all-time favourite books, ‘Rebecca’. Although I have visited Cornwall several times before over the years, I had never been to Fowey which of course is where she lived. Visits to Cornwall always remind me of my last few years spent living in California. My marriage was in a very bad way and my ex-husband and I, by that point, were nothing more than passing ships and all that. My life was primarily spent with my children and my friends. I didn’t want it to be that way but there it was, there it is, the reality of the way my life was back then. It was during that time that reading Rebecca gave me the escape that I longed for, lost as I was as I walked the long road to Manderley, took tea in the drawing-room, the cups and silverware laid out on crisp, white linens and all the while trying to avoid the icy stares of Mrs Danvers. Or perhaps it would be while strolling along the wild, coastal path leading me down to the troubled sea and eventually to the fisherman’s hut on the beach where dark and mysterious secrets lay hidden, awaiting eventual discovery and the desperately sought-for answers to Maxim’s brooding turmoil. This story of unrequited love, betrayal, murderous accusations, and then the unconditional love of a young innocent girl for her older, complicated and haunted husband took me far away from my own dark sea of hopelessness and empty longing for a happier life. I could live out another’s story of helpless misunderstanding while all the while trying to do the right thing yet never quite able to, or so it seemed. Perhaps then, it is no coincidence that so many years later, and certainly not imagined in my mixed-up thoughts for a single moment, that during one of our very first conversations having met only once or twice, I happened to ask my now-husband what his favourite film and/or book was. Just out of curiosity. “It has to be Rebecca”. I knew then that I was home. This entry was posted in Books & Reading, Current Affairs, Family Life, Musings, My California, Photos, Travel and tagged Author, Books and Reading, British Isles, Cornwall, Current Affairs, Daphne Du Maurier, Family Life, Fowey, Italian Job, Looe, Marriage, Movies, Musings, My California, travel, West Country, Withnail & I, writing. Bookmark the permalink. I still haven’t been to Cornwall, but after reading Rebecca last year, I’ve been dying to go. Glad you two are such a good fit. And thanks for guest posting on my blog today! I’m excited. However, I hope it isn’t the last time I see you guest posting on my blog. You tell me when you want to appear again. I find your writing so inspirational and heartfelt. I will make an announcement here tomorrow morning first thing to link into the guest post if that’s ok? Cornwall looks like an absolutely lovely town! The pictures have me wishing that I could be sitting inside gazing out over the water. I haven’t seen or read Rebecca, but your story compels me to add it to my list! What a lovely place to celebrate Nicky’s birthday, Sherri. Thank you for sharing your stunning photos! I want to be there now!!!!!! Well, a young man has to party with his mates on his birthday. 🙂 I’m glad you’ll be seeing him again this weekend. I’ve never read the book but I just love, love, love Hitchcock’s Rebecca and have seen it numerous times. When I saw the title of your post I hoped it was going to be about this Rebecca and it was! 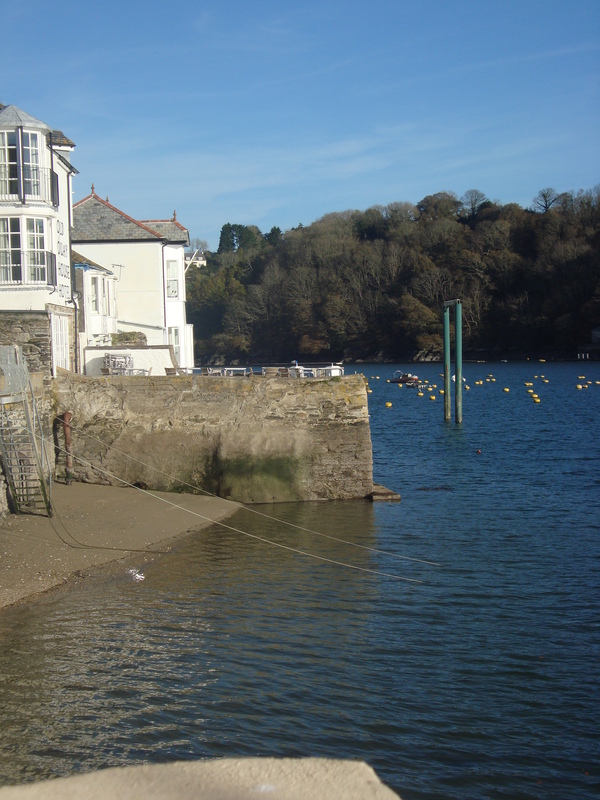 I love the photos of the harbour at Fowey. What a gorgeous place! ‘Last night I dreamt I went to Manderley again’ has to be one of the most famous first lines in recent literature. I loved Rebecca too, as well as Frenchman’s Creek. Cornwall is a truly inspirational place, very mystical, creative and quirky. Glad you had such good weather – we are off down that way soon after Christmas. Can’t wait to wrap up warm and have a good long walk along the beach. What a lovely time of year to visit Cornwall. We haven’t been for some time, but we were visiting people who live near Looe so it was the perfect little escape 🙂 You must be really looking forward to your break there after Christmas! I’ve been rediscovering Cornwall recently. We used to go regularly as children but there has been far too wide a gap in our visits as we’ve explored further afield and the lure of ‘abroad.’ Quite simply, there is nowhere else like it – at least, nowhere else I’ve ever been. I think it is magical. Yes, you’ve nailed it on the head. I don’t think we ever appreciate things enough when we’re young. Believe it or not, I’ve never read Rebecca. I’m ordering it right now! Gorgeous photos, Sherri. Thanks for sharing! Ditto! It’s been sitting on my bookshelf and I need to start a new book, so that’s that decided! 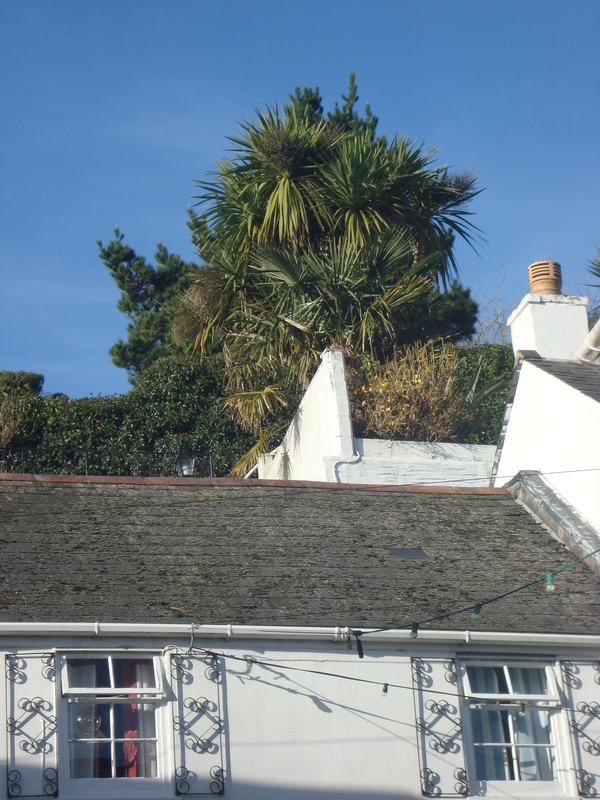 I totally agree with you about Fowey, we found this too but then when we were there it was exceptionally busy with the Christmas market but we were baffled as to the lack of waterside walking. Looe is delightful, we loved it. BTW did you know that Dawn French lives in Fowey? We didn’t see her of course…. 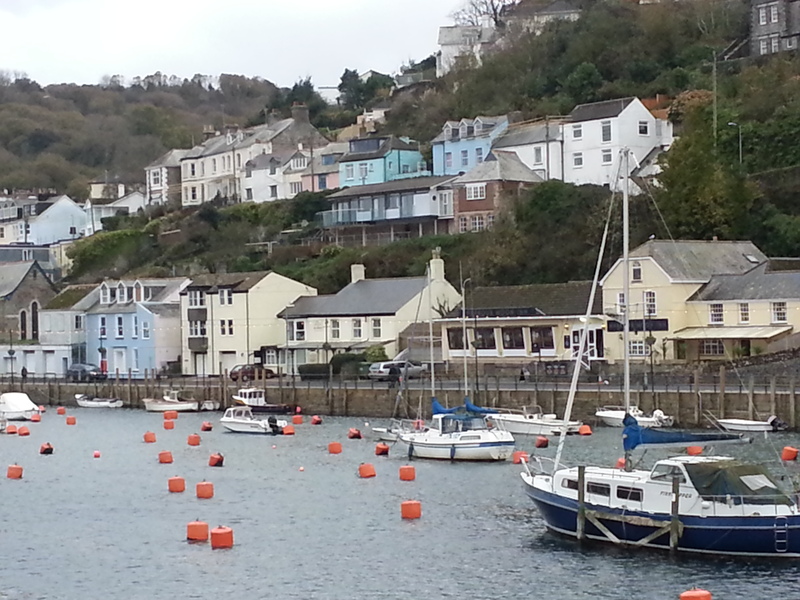 Quaint houses in a harbour setting make my heart sing. I grew up by water and miss it every day. These pictures are wonderful. I must find my copy of Rebecca if I still have it and re-read now that you’ve brought her up. I wonder what I will feel reading it at this age. The last time, I was young and knew less than nothing about life. There is something so relaxing about being by the water and in harbour settings, and having the sun come out with those beautiful blue, winter skies, really made it. It was back to dark and overcast by the next day! Hello Bulldog, how lovely for you to come over from TB’s blog and visit! I am very grateful that you took the time to read not only my guest post but also to come over here and then to follow, thank you so much! Ahh, thanks so much Steve, really glad you enjoyed reading this post and also the pics! Cornwall really is a wonderful place isn’t it? Your final words touched me. Thank you for sharing this! I’ve always wanted to visit Cornwall, largely because of the romantic image I have of it from du Maurier’s novels, which I love. It has such an air of atmosphere. One day we will, it’s just a bit of a trek from up here in the north east! But then we do also have a rugged, romantic coastline, so I can’t complain. Yes, you have beautiful scenery up in the north east Andrea, a place that I haven’t visited enough. Beautiful photos. Closest I’ve been was at RAF St. Mawgan http://en.wikipedia.org/wiki/RAF_St_Mawgan back in the day, if memory serves me. Cornwall looks so beautiful. I’ve never visited England, but when I do a trip to the West Country will definitely be on the agenda. Love the story of you and your husband’s connection over the story of Rebecca. Thanks so much Marlene, so glad that you enjoyed reading this post. So glad you enjoyed reading M, thanks so much! Yes, that is precisely what we did, managing to find a delightful pub right on the waterside and have a drink in the sunshine while soaking up the magnificent view! There is something hauntingly beautiful about harbours and the shore and being able to stop and take time out just to enjoy and really unwind. No wonder so many people visit these places! Another thought…. Speaking of harbors, we have never been to the United Kingdom (yet) but were about 350km away from Looe last fall: walking around La Havre, France. That is really interesting, thanks for sharing M, I had no idea that there is a Looe in France!! Wonderful pictures, Sherri! 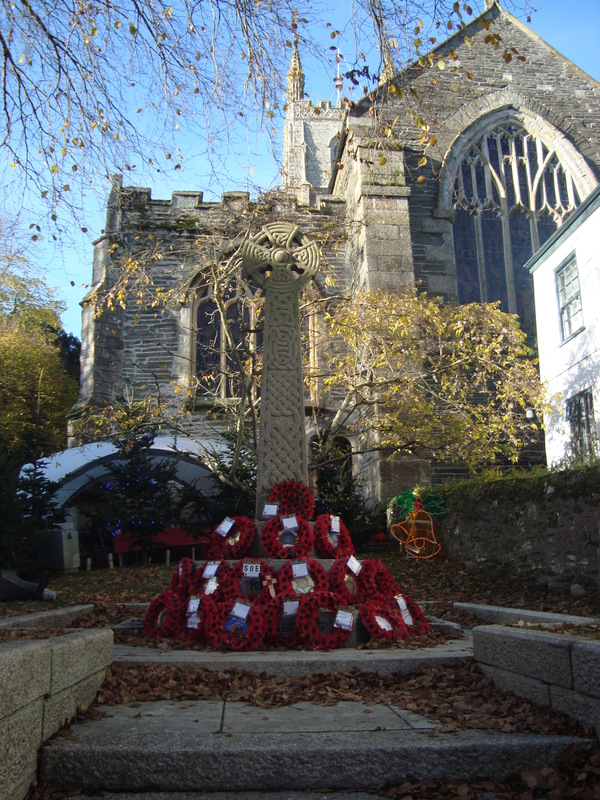 While I loved the harbors and views, I was especially touched by the poppy wreaths in front of the church. You are a natural story teller! So glad that you enjoyed this read and the photos Marylin, thank you! Yes, in all our towns these memorials are covered in poppy wreaths for many months to come until the weather batters them to nothing. There are also little wooden crosses everywhere so that the rememberance goes on long after November 11th. Your Max DeWinter is hopefully not so dark!! A beautiful piece – and i’m seeing Cornwall as an enchanting and brooding place in turn. Such beautiful pictures Sherri. Rebecca was my favourite book too – love Daphne du Maurier. It’s lovely reading about your life and how you found your love. Thanks so much Jo, I’m so glad that you enjoyed the read and the pics too! Ilka, I am so happy to know that you enjoyed reading just a tiny bit about Cornwall, but also that you love Rebecca too! I do have a measure of peace in my life now that was certainly missing for a long time but I think too that so much of that has to come from within as much as from the wonderful people we know and love. I realised long ago that it is impossible to fix anyone other than ourselves! Thanks so much Glynis, how lovely of you to say! They were very tumultous times and it was very hard to leave my home and the life that I had built up for myself and my children over in California but I always knew that I needed to return ‘home’ here when everything fell apart. Cornwall and California – would never have linked the two but now I always will. PS The strange thing is that I never really had a particular closeness to Cornwall having never visited it until I first moved back here and not having any family ties there or anything until very recently, yet it had such a strong pull on me because of ‘Rebecca’. Hi Sherri – just wanted to let you know I nominated you for the “Sisterhood of the World Bloggers Award” at http://plaintalkandordinarywisdom.com/oh-boy-got-more-awards-for-which-to-give-thanks-and-share/. Hi Sherri! I’m glad our blogging paths met today. I wasn’t expecting to come here and find a post about my home region – now I’m feeling all nostalgic. I’m proud of my region, and every time I go back I go to the coast, breath in the sea air, look at the crashing grey waves and listen to my favourite sound ever: seagulls. It was a really lovely time of year to visit and to have the sun come out too was a real blessing. This looks like a beautiful place to visit. Your photos are lovely also! Hi Diane, sorry, only just saw this! So glad that you enjoyed reading and the pics too. Yes, Cornwall is a very beautiful yet rugged place. You would love it, I know it!! Wow, I love the Rebecca story – yours that is, I haven’t read the novel myself (sorry!). How perfect. I am angry at myself that I have never taken the time to holiday in Cornwall. I have always thought it looked like such a lovely, charming and diverse place. The photos back me up here, the view of the harbour is breathtaking – worth the trek! You won’t find much like that in Norfolk. Great stuff!